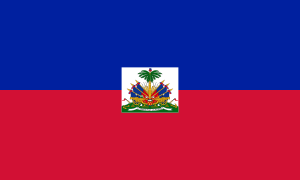 Afro-Haitians are Haitians of African descent. They are mostly the descendants of slaves brought to the island by France to work on plantations. As of 2013, Afro-Haitians are the majority ethnic group in Haiti, accounting for 95% of the country's population. About 5% of the country is of white or mixed heritage, having partial African and European ancestry. Haiti's slaves derived from African areas from Senegal to the Congo. Most of these slaves came from Central Africa (Kongo) and current Benin (Ewe, and Yoruba). Other slaves in Haiti came from Senegal, Guinea (imported by the Spanish since the sixteenth century and then by the French), Sierra Leone, Windward Coast, Ghana and Southeast Africa (such as people of the Bara tribesmen of Madagascar, who arrived in Haiti in the eighteenth century). 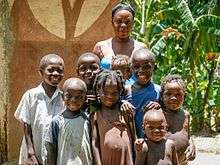 According to The World Factbook, 95% of Haitians are primarily of African descent; the remaining 5% of the population are mostly of mixed-race and European background, and a small number of other ethnicities. Culture, religion and social organization are the result in Haiti of a process of syncretism between French and African traditions, mainly Dahomey-Nigerian. An important cultural practice in Haiti is Haitian Vodou. This probably originated in Benin, although there are strong elements added from the Congo of Central Africa and the Igbo of Nigeria, and many African nations are represented in the liturgy of Sévis Lwa. A generally ignored but significant element is that of the Taino people, the indigenous people of Hispaniola. The Tainos were influential in the belief system of Haitian Vodou, especially in the Petro cult, a religious group with no counterpart on the African continent. Characterized by the worship of the loa, the sect has influences from Native American folklore zemis. The entire northern area of Haiti is influenced by the practices of the Congo. In the north, these are often called Rito Congo or Lemba. In the south, the Congo influence is called Petwo (Petro). Many loa are of Congolese origin, such as Basimbi and Lemba. Two languages are spoken in Haiti. French is taught in schools and known by about 42% of the population, but spoken by a minority of mulattoes and blacks, in Port-au-Prince and other cities. Haitian Creole, with roots in French and African languages, is a language with dialectal forms in different regions. It is spoken throughout the country, but is used extensively in rural areas. The music of Haiti is heavily influenced by the rhythms which came from Africa with the slaves. Two of these rhythms come directly from the harbour and the Congo; a third rhythm, the "petro", developed on the island during the colonial era. All are part of the rhythms used in Vodou ceremonies. These rhythms have created a musical style, rasin, where percussion is the most important musical instrument, and despite being closely related to religion has become a popular kind of folk music. Another type of music, which arises spontaneously from people with hand-held instruments, is twoubadou, a musical style that has endured to this day. Currently the music heard in Haiti's Compas genre is a little softer than the merengue, and combines Congo rhythms with European and Caribbean influences. Kompa is the most current version of this rhythm. 1 2 3 "Haiti: People and society: Population". The World Factbook. 28 September 2016. Retrieved 18 October 2016. ↑ Fernández Esquivel, Franco (2001). "Procedencia de los esclavos negros analizados a través del complejo de distribución, desarrollado desde Castagena" [Origin of black slaves analyzed through a distribution complex developed from Castagena] (PDF) (in Spanish). Revistas Académicas de la Universidad Nacional. Retrieved 7 October 2016. ↑ "African Origins of Haitians". haiti360.com. Archived from the original on 15 November 2014. ↑ "Opinión: El merengue Dominicano y su origines" [Review: The Dominican merengue and its origins] (in Spanish). ciao.es. 16 August 2003. Retrieved 7 October 2016. ↑ "Country profile: Haiti". bbc.co.uk. 17 October 2012. Retrieved 7 October 2016. ↑ "New Haiti Census Shows Drastic Lack of Jobs, Education, Maternal Health Services". United Nations Population Fund. 10 May 2006. Retrieved 7 October 2016. ↑ "Haiti: Population". Library of Congress Country Studies. Retrieved 7 October 2016. ↑ "The Virtual Jewish History Tour: Oceania: Haiti". Jewishvirtuallibrary.org. 2010. Retrieved 7 October 2016. ↑ Shanshan, Wang; Huang Zhiling; Guo Anfei (19 January 2010). "Chinese in Haiti may be evacuated". chinadaily.com.cn. Retrieved 18 October 2016. ↑ "Zombis: Vudú haitiano" [Zombies: Haitian Voodoo] (in Spanish). linkmesh.com. Retrieved 7 October 2016. ↑ Wolff, Alexandre (2014). La langue française dans le monde 2014 [The French language in the world in 2014] (PDF) (in French). Paris: Nathan. ISBN 978-2-09-882654-0. Retrieved 7 October 2016. ↑ "Población haitiana" [Haitian population] (in Spanish). mondolatino.eu. Retrieved 7 October 2016.